The Venetian Resort Hotel and Casino is one of the most popular resorts located on the Las Vegas strip. This enormous sized AAA Five Diamond rated Vegas resort sets the standard for luxury and opulence, bringing a touch of elegance and style to any guest who is lucky enough to stay at The Venetian in Las Vegas. 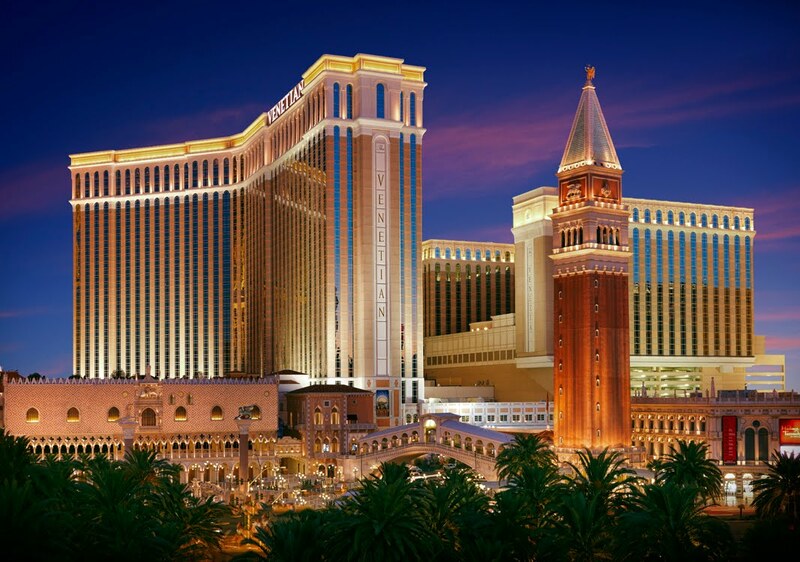 If it’s location you are after, the Venetian in Las Vegas is a great hotel. The location of the Venetian Las Vegas is near many of Las Vegas’ strips great restaurants, shops, bars and even many of the other Las Vegas casinos. The McCarran International Airport is just 5 miles from the casino, so it’s really convenient getting to and from The Venetian. The thrill of Sin City starts as you arrive at the Venetian hotel. You are met with a plethora of beautiful chandeliers and water fountains, the beauty and elegance of the hotel’s decor is on show for everyone to see, that’s if you are not too distracted from the host of other attractions. With all the luxury facilities you would come to expect from a 5 diamond all-suite resort from luxury rooms to fine dining restaurants to upscale retail outlets to a 120,000-square foot casino, when visiting The Venetian there really is no need to leave the resort. You can take a tour of the Grand Canal which is located under a domed roof inside of the Venetian. Gondola boats allow guests to take a relaxed ride in the capable hands of singing gondoliers that will make you feel like you are in Venice, Italy. The replication of St. Marks Square where you will find a number of restaurants and shops, and the Bridge of Sighs and Doge’s Palace keep in tradition with the resort’s Venice theme, providing a range of things to see and do on the resort before you can even check in! It’s like its own city within the boundaries of Las Vegas. If it’s relaxation that you are after then the Venetian Las Vegas offers it in bucket loads! The resort features a 134,000 square foot Canyon Ranch Spa Club, featuring all of your favorite treatments, pools and saunas. After spending the day pampering yourself and relaxing, there is no better place to enjoy an evening than at the world famous AquaKnox restaurant also located on the resort. Widely regarded as one of the best restaurants in Las Vegas, this world class dining destination offers a range of expertly prepared seafood dishes from top chefs. As well as the top class spa and pool facilities, restaurants, Gondola rides and a luxurious suite, the Venetian Resort Hotel Casino also features many other attractions. The Grand Canal Shoppess consists of 80 top international boutiques that is perfect for shopping and there is great entertainment courtesy of the many Broadway Shows to ensure that all guests have something to do during their stay. When you do actually get to make it up to your room, you will find that the Venetian offers suites bigger than you could have ever imagined. At a spacious 650 square feet this luxurious Las Vegas hotel offers standard guest rooms which are nearly double the size of other rooms on the Las Vegas strip. The Venetian suites feature all the luxuries, including LCD TV’s, Free WiFi, Italian-Marble baths and sunken living rooms. The beds are large and comfortable, dressed in Egyptian-Cotton linen with white goose-down duvets. The decor inside the suites is clean and cosy, ensuring great relaxation after a long day sightseeing, shopping or even gaming! The Venetian is home to a grand casino, featuring casino table games and slot games galore. There are a plethora of casino table games such as Blackjack, Roulette, Craps, Baccarat, Pai Gow Poker, Caribbean Stud Poker, Let It Ride and Keno. It also has nearly 2,500 slot machines so that slots lovers have a wide selection of fun slots to choose from including Megabucks, Wheel of Fortune, Elvis and Jeopardy. If you walk into the High Limit room at the Venetian casino, you will find a private Gold Lounge area for free coffee, tea, water, juice and some other nibblies. Unlike other VIP lounges at casinos on the Las Vegas strip, this one is open 24/7. The Sands Poker Room at the Venetian Casino has been recently remodeled and features 59 poker tables. At 14,000 square feet, the Venetian houses the largest poker room in Las Vegas. The commonly spread cash games spread are $1/$2, $2/$5, and $5/$10 NL Hold’em, as well as $4/$8 Limit Hold’em. There’s also less commonly games being spread such as $4/$8, $8/$16, and $15/$30 Omaha Hi/Lo, Pot Limit Omaha $1/$2 and $2/$5 games can also be found. Other games including mixed games will be dealt upon request if there is enough interest. The Venetian Poker Room hosts daily NL Hold’em tournaments, with varying buy-ins from $125 to $300. The buy-in for the daily noon tournament on Mondays through Thursdays is $150. On Fridays and Sundays there is a $200 buy-in NLH tourney. On Saturdays, there is a $300 buy-in event. The Venetian also hosts the Deep Stacks Extravaganza tournament series, which attracts poker players from all around the globe. Each of the tourneys in the deep stacked series has a good structure, making The Venetian’s Deep Stacks Extravaganza hugely popular with poker players. The Venetian in Las Vegas really does have it all. It has nicer and larger guest rooms than any other hotel on the strip. If you’re looking to experience luxury and excitement at its best then the Venetian Resort Hotel Casino comes highly recommended.